Happy Easter to all! Also, happy General Conference week, and I invite all of you to prepare for this wonderful opportunity to learn from prophets of the Lord! This week was definitely a week of ups and downs. Things are still moving slowly for us in our area. 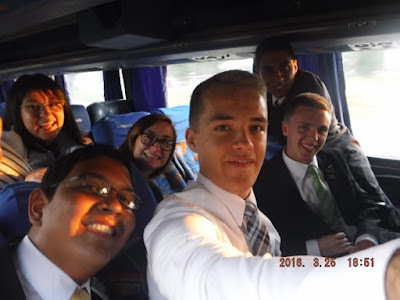 Sometimes it can be a little frutratring as well, because the other elders in Nogoyá are having a lot of success in their part of the city, and already have three people who will be baptized the 10th of April. Of course, we are super excited for them, and we love their investigators a lot, but sometimes, it is easy to ask yourself why you aren't having the same success. However, I know that this is not my work, or the work of me and Elder Marquez, or of Presidente Perez. This is the work of the Lord, and He will run it how He pleases. We only have to make sure that we are doing everything that we need to in order to be worthy of His Spirit, and then work, work, work. This past week my companion and I spent a lot of time contacting, knocking doors, talking with people in the street, visiting less actives, and whatever else we could do to find people. We've had countless people tell us that we could come back to share our message, but every time, either they aren't home, or they pretend they aren't home. Those ones are funny, because they look out the window, make eye contact with you, then hurriedly close the window and turn out the lights. My companion and I always laugh after that and just say ¿que va a hacer? Huge highlight of the week, we had zone conference on Friday in Victoria. We spent the majority of the day in the church in Victoria with Presidente and Hermana Perez, Elder Heredia and Elder Blackmon (asistentes), and our little zone of 12 missionaries, six from Nogoyá and six from Victoria. I learned a lot, and afterwards we each had interviews with Presidente, which are always uplifting and inspiring. My companion and I have a lot of goals going forward, and hope to be able this week to truly be instruments in the hands of the Lord, and bring about His work. We also ate super well at the conference (salads, empanadas, facturas, torta, frutas, jugos, dulces, etc. ), and especially since we so far have had two lunches from members this whole transfer, it's nice to not have to worry about food for once. I know that this is the work of the Lord, and that He directs His church! Again Happy Easter and watch General Conference!